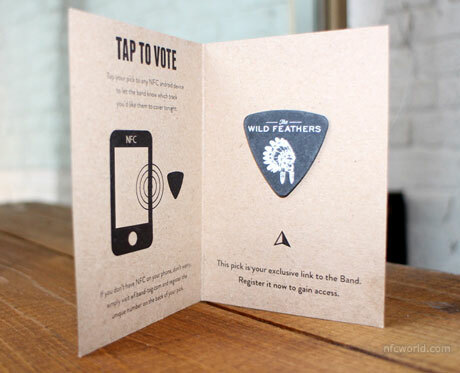 Fans attending gigs by Warner Music act The Wild Feathers have been provided with guitar picks containing an NFC tag. These could then be used to enter a competition, share content via social media and take part in votes at the gig, all initiated by tapping the plectrum with an NFC phone. The guitar picks were placed inside promotional flyers for the band at six venues across Europe and were developed by NFC specialist RapidNFC and mobile marketing provider Qodo. Each pick was encoded with a unique URL and additionally printed with a unique code for iPhone users.